Leon Paul from Mumbai, B.E. - B.Tech Graduate. 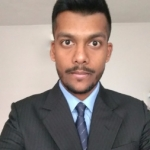 Leon Paul is Leon Paul Resume Data Scientist and currently have no work experience. DATA ANALYSIS DATA MINIG MACHINE LEARNING DATA STORAGE PREDICTIVE ANALYTICS.. STATISTICAL ANALYSIS.. STATISTICAL MODELING..
are one of expert skill area's of Leon Paul . Leon Paul is working in IT Software industry.